Visitors approaching the Priory along the lane may be forgiven for thinking they are coming to a castle, for their first sight is of a tower, gatehouse and fortified walls. 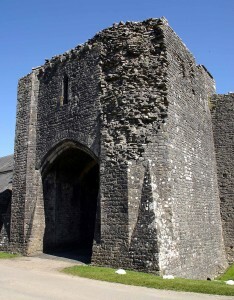 The fortifications were first erected in the 12th century, and extended in the late 13th, providing protection for the monks from the repeated raids of the Welsh from the north, and also to house a garrison as part of the defensive ring around the Ogmore area, which included Ogmore, Newcastle and Coity castles. The church tower acted as a look-out post. King Edward I, during his conquest of Wales, came to Ewenny for inforcements in 1284. King Henry IV is said to have come to Ewenny in September 1405 to make his final assault on Coity Castle to relieve it from the rebellious supporters of Owain Glyn Dwr; because of bad weather, his efforts ended in total failure.